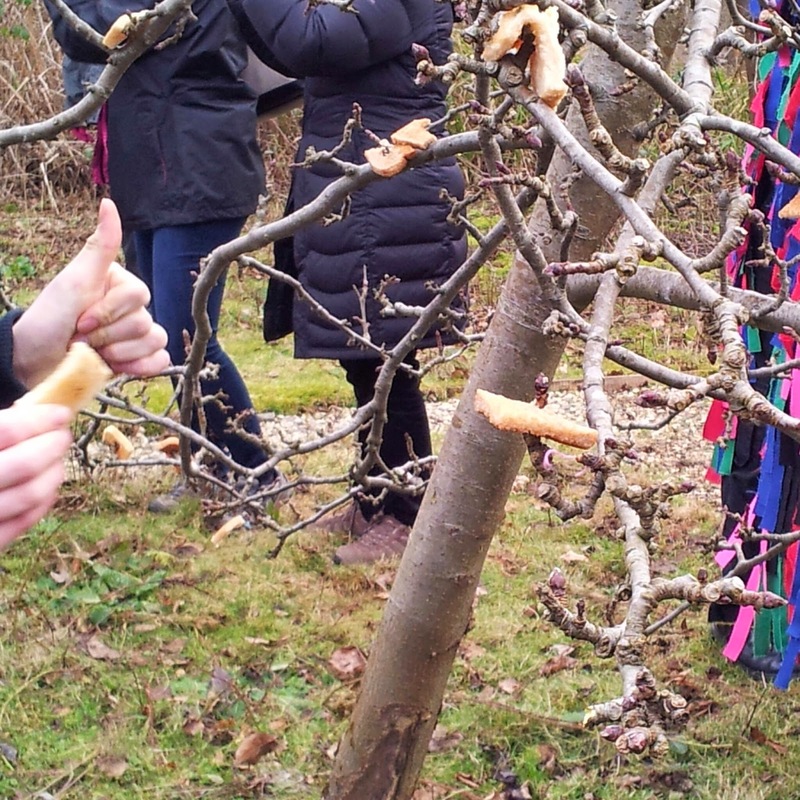 On Sunday we headed back to Brandon Marsh to take part in a traditional wassailing of their orchard. Although I'm vaguely familiar with the ceremony, I've never been to an orchard wassailing before, so wasn't quite sure what to expect. The answer was lots of dancing! 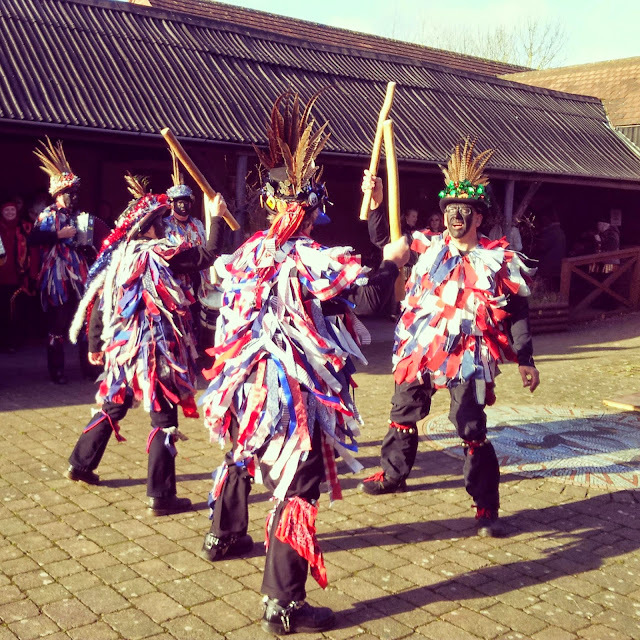 Walking down the driveway (the carpark was full) to the visitor's centre we could hear the booming of a big drum being hit but we were still surprised to step through into the courtyard to find it playing host to what appeared to be a Morris Dance off! Several different troupes took their turns in an endless dance to bring back the sun, while accordionists, pipers, fiddlers and drummers kept time to the ever present jingle of bells. The Pretty Men - as M dubbed them. The Pretty Men - look at their fantastic hats! I think there were six different troupes, some of which had both male and female members. One group was comprised wholly of ladies and there was also a group of Appalachian dancers on a set of wooden boards they'd brought with them. Careful observation also showed dancers moving between troupes, as they shared members. More Morris Dancers than I've seen in one place before. M watched with a huge grin on her face as dance after dance played out in front of us. Oblivious to the cold, M twirled and moved to the music herself, getting into the spirit of things. Her favourites were a group M dubbed 'The Pretty Men', who wore fantastic hats covered with feathers, tinsel, holly and fairy lights. M was also impressed with the footwork of the Appalachian dancers, observing they were tap dancing, but dancing a lot quicker than she did. 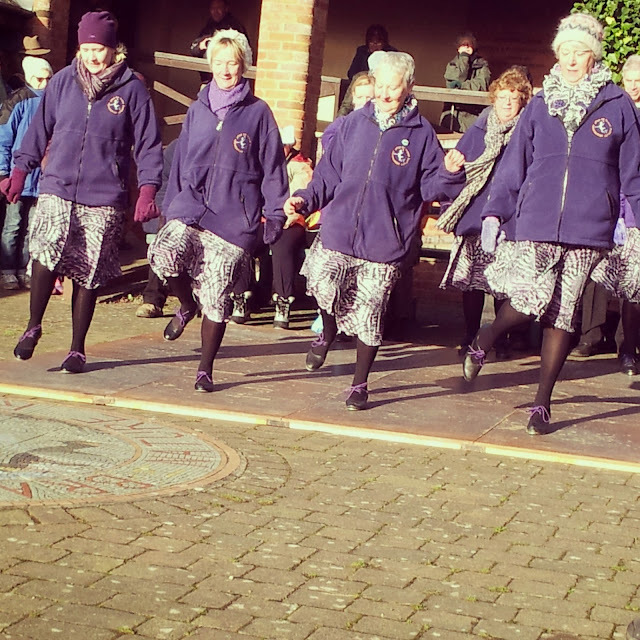 The all ladies group (The Black Alice Ladies Morris Dancers) also caught M's eye, with their glittery clothes. She was concerned at how some of the dancers had blacked their faces, asking if they would be able to get them clean again. I assured M that in my experience, vigorous application of a wet wipe will remove facepaint, unless it is green facepaint of course, in which case you are doomed to look jaundiced for a week after it's removal. For those who are curious, apparently Morris Dancers used to traditionally black their faces to disguise their faces so their employers wouldn't recognise them. Appalachian Dancers take to the boards, which they'd brought with them. 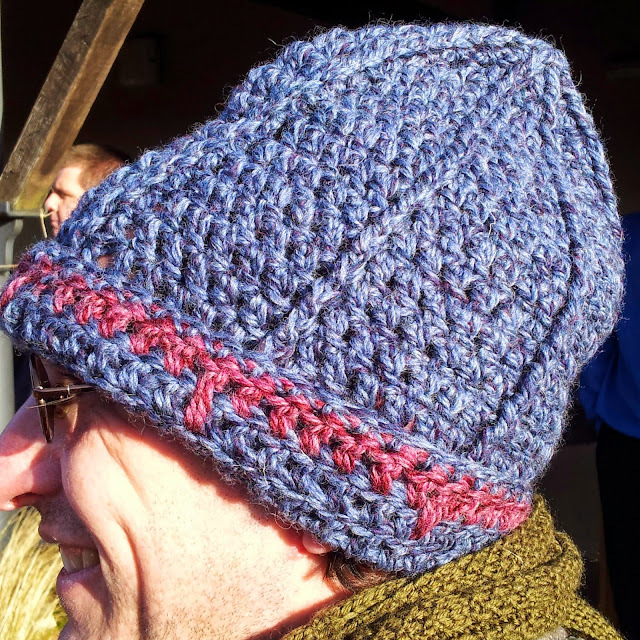 Dave was trying out his new hat (Ravelry link), a smaller version of the one I made for Richard. Dave's new hat, which has the useful property of not falling off while Morris Dancing. We had a fantastic foot-tapping time watching and Dave was unable to resist the lure of an open invitation to join in the last dance. He grabbed a stick and he was off, much to M's delight. 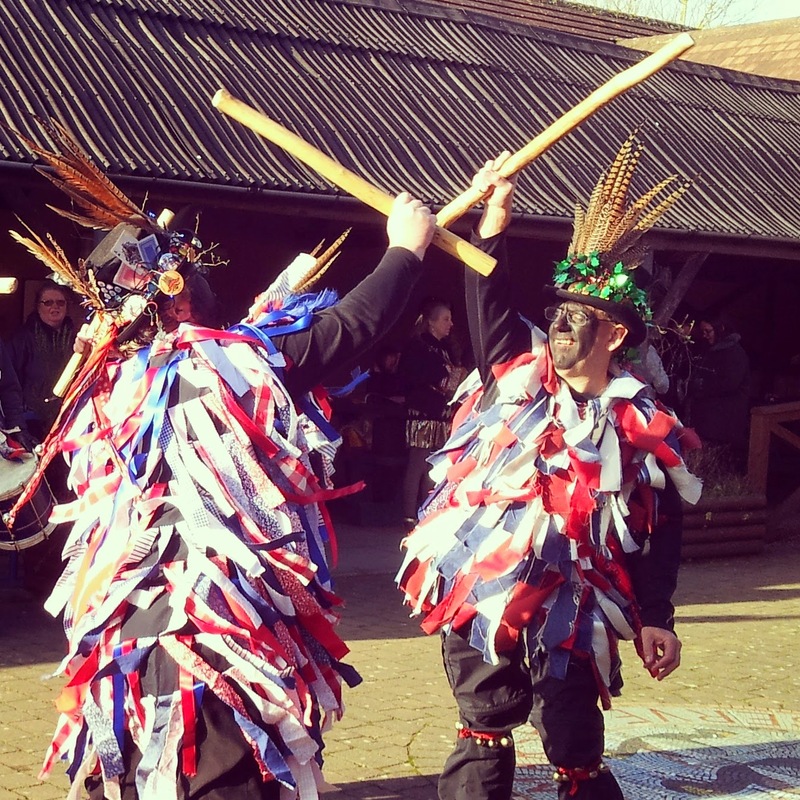 Here is a clip of Dave trying out Morris Dancing. Dave informed me his new hat had the excellent property of not falling off during an impromptu spot of Morris Dancing. Once the last dance was done, we all moved off in procession towards the fruit orchard to wassail the trees. 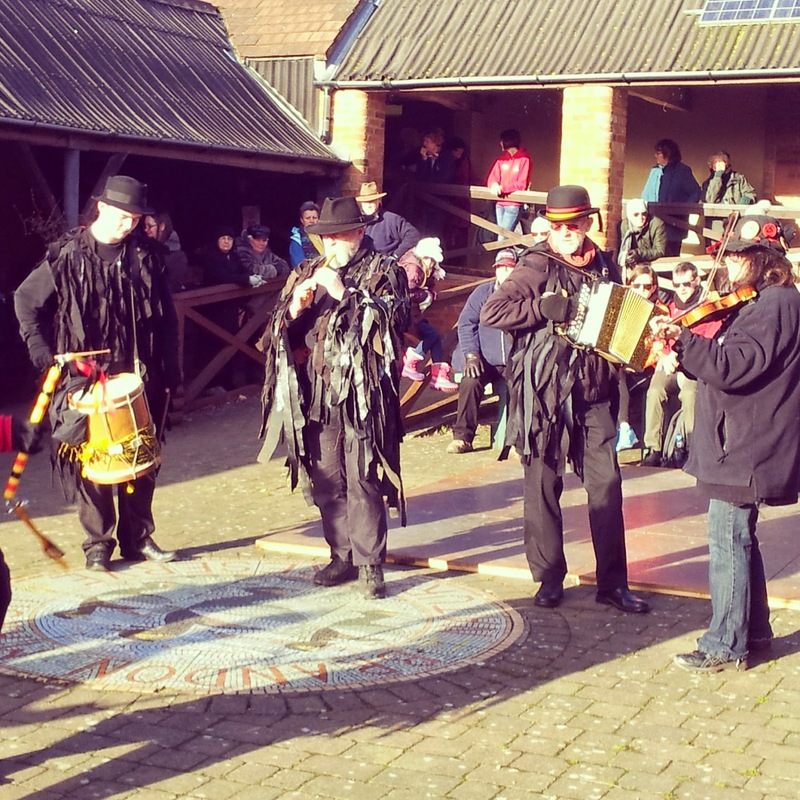 There we watched as the morris men and ladies formed up in a circle and we were told what needed to be done. "Apple tree, apple tree, we all come to wassail thee." They sang. They danced. We made noise (to wake the trees up). After this we all made the traditional offering of toast dipped in cider, which everyone took turns to press onto branches of all the trees. M had a go at this, but couldn't quite manage the fiddly task with soggy toast. Toast dipped in cider was pressed onto the branches of the apple trees. 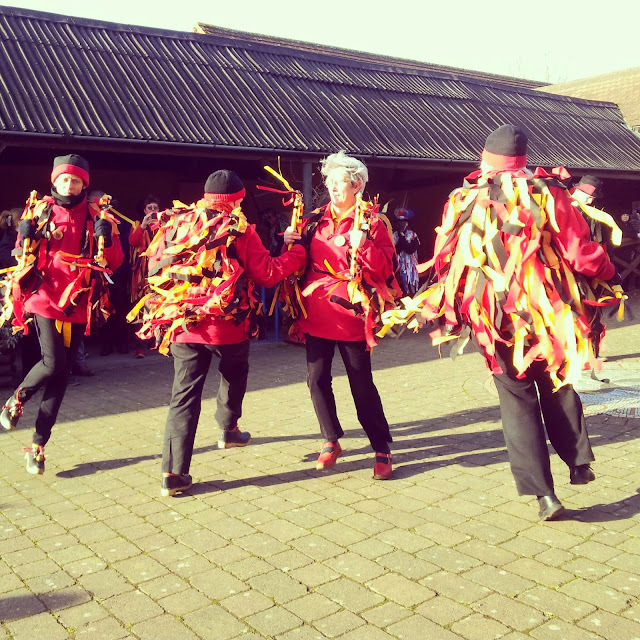 Wassailing done, we went home to warm up. After a late lunch, M decided our garden's fruit trees and bushes shouldn't be left out, so Dave and M headed outside to sing to them. M danced around the garden, emulating The Pretty Men as best she could, before singing a song about an apple seed that was planted by a little girl and grew into a full sized tree at midnight. Singing and dancing done, bits of pancake were pressed onto branches of trees and bushes, before my wassailers returned to the warmth of the house. I am hopeful that the gooseberry bushes in particular have taken note of the ceremony and will bear fruit for the first time ever this year.